This is a charming book which wears its learning lightly. The rather jokey cover (a barrage of puns, both verbal and visual, on a series of opera titles) leads you to think that you have come across one of those books of lists of comic and amazing facts. Myer Fredman�s book is rather deeper than that, but the format and style retain a certain lightness of touch. The book is organised into a series of sections, The Creators, The Re-Creators, Study and Beyond, The Complete Rehearsal Period, The Administration, The Audience, Operatic Mishaps and Other Cautionary Tales, Opera Companies, Past, Present and Future? which comprehensively cover the whole operatic genre. Each section is subdivided into a series of salient chapters (Musical Director/Conductor, Producer/Director, The Conductor-Producer Relationship etc.) and each of these is further subdivided into substantial, self-contained paragraphs. The effect is carefully controlled by Fredman, so that there is a sense of narrative flow but the principal feeling when reading the book is that of receiving a series of separate facts rather than a continuous narrative. The results are obviously intended to make it easy for the target audience, but I found the approach a little tiresome at times. Fredman is careful to be direct without courting too much controversy. On the subject of conductor�producer relationships, detailing the perils of incompatibility without naming names or giving concrete examples, but also mentioning the benefits when the balancing act works. Tactfully Fredman rarely gives examples, confining himself to the more abstract. Style apart, a more serious problem with the book is the series of spelling errors. Sean Edwards for Siân Edwards, Cho-Cho San for Cio-Cio San, Massanet for Massenet etc. Some more careful proof-reading is needed. One can always pick holes of a factual nature in books which are full of information, but it is surely misleading to say that Ethel Smyth conducted a choir of suffragettes with a toothbrush without explaining that she was in prison at the time and was leaning out of her cell window. Similarly, saying that Nadia Boulanger more recently made an impression on the revival of Monteverdi, is to rather stretch the definition of �more recently�. He has quite strong opinions, some of which I find rather unhelpful. For instance he refers to "the difference between the intrinsic Italian and German character; the former being emotionally instinctive and the latter more intellectually orientated". This is surely a caricature and is not really helpful to a newcomer to opera. Or again he seems to disapprove of the tendency for opera houses to employ specialist baroque bands to perform the early repertoire; a matter on which people should surely be encouraged to think for themselves. Unfortunately the scheme of the book means that any lengthy discussion of such thorny topics is difficult. But there is a lot of good sense here. With a lifetime�s experience, Fredman is familiar with the foibles of singers. He is robust in his attitude to "the exaggerated myth of a singer�s �temperament�". And his discussion of the whole business of what it means to be a singer in opera will be no end of help to non-singers struggling to come to understand the vagaries of the operatic world. Myer Fredman was for many years on the music staff at Glyndebourne and then went to develop a career for himself in Australia. The book seems to retain an element of the Glyndebourne connection as all the pictures are from Glyndebourne productions. These twenty or so colour illustrations help to give a good visual element to the book. This would be an excellent book to give to someone who is just developing an interest in opera. 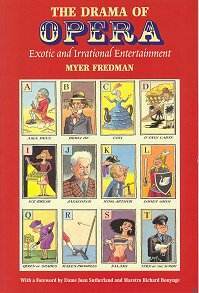 It is not so much a book for old opera hands, though even they will perhaps find the odd nugget of interest in Fredman�s wisdom.